More than 900 jobs have been lost in Northern Ireland's construction and manufacturing industries since the start of the year as the economic crisis continues to take its toll. News that some 200 positions are at risk within the Lagan Construction Group is another hammer blow to both beleaguered sectors, with experts claiming that current pressures show no sign of abating. It is the fifth significant job loss announcement this year following on from cuts to the workforces at Schlumberger, Williams Industrial Services (WIS), Kilroot, Wrightbus and Acheson and Glover (AG). Earlier this month a trade union claimed that French oil services firm Schlumberger will go ahead with the closure of its Newtownabbey site, which employs 205 people. Engineering firm WIS was put into administration with most of its 145-strong workforce in Mallusk made redundant straight away after it ran out of funds. Combined with 95 posts in jeopardy at Wrightbus in Ballymena, a further 45 at Co Tyrone building contractor AG, and the loss of 270 jobs announced on January 27 over the planned closure of Kilroot power station by energy company AES, Northern Ireland could see more than 900 jobs go in just a few months. Ulster Unionist MLA John Stewart said the latest blow concerns "jobs which Northern Ireland simply cannot afford to lose", and he blamed the political stalemate between the DUP and Sinn Fein for exacerbating the crisis. "Two weeks ago we received the news that hundreds of jobs were to be lost with the closure of Schlumberger and Williams Industrial, and now Lagan Construction Group are in difficulties," he said. "It is simply unacceptable that we cannot get government restored at Stormont whilst we are haemorrhaging jobs and facing a crisis in our hospitals and our schools. The people of Northern Ireland deserve better than this." 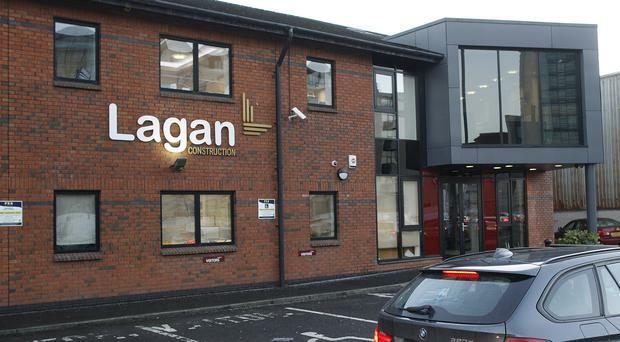 Staff at Lagan Construction Group were told yesterday the business had been "significantly impacted" by delays and disputes involving several projects. Four of its 30 companies have gone into administration - Lagan Construction Group Holdings Limited, Lagan Construction Group Limited, Lagan Building Contractors Limited and Lagan Water Limited - while the others are continuing to trade. Group boss Michael Lagan said that parts of the group had been significantly affected by a number of factors including delays in the commencement of new projects, protracted contractual disputes on some existing major projects, and instability caused by a joint venture partner in Britain. "It is with great sadness and reluctance that we have had to take this course of action," he said. "We have had long-standing relationships with many sub-contractors and suppliers. We hope that the process of administration will be smooth and that disruption to both projects and jobs will be minimal". The Construction Employers Federation (CEF) said the announcement was "extremely regrettable given the huge contribution that Lagan Construction Group have made to Northern Ireland's economy and society". CEF managing director John Armstrong said the industry has faced "a challenging period in respect of its sustainability" from issues including low margins on works, insufficient pipelines of activity, and the current political and budgetary challenges within Northern Ireland. He added: "These must be matters of concern to anyone who wishes to see a healthy and vibrant Northern Irish construction industry given its critical role in delivering jobs, economic development and growth." Lagan Construction Group's current projects include Ulster University's new Belfast campus, which has been hampered by delays. An Ulster University spokesman said it has been informed of problems at Lagan Construction, adding that completion of the building now falls to the joint venture partner Somague, including payment to all suppliers. "Lagan Construction Group Ltd has informed the University of their decision to call in administrators to four companies. The University will now consult with the administrator and Somague Engenharia, SA as necessary and continue to progress delivery of the project," he said.